Objective. The permafrost microbiome synthesis group was formed to inform our understanding of how microbial communities in permafrost change following permafrost, as well as the functional implications to changes in microbial assembly. We expect this to help constrain our understanding of the role of the microbiome in greenhouse gas production from thawed permafrost. Plan. We are building a database of bacterial, archaeal, and fungal sequences from permafrost soils. In the near term, we expect to produce (1) an overview paper of the state-of-the-knowledge about the permafrost microbiome in a changing Arctic (as we assemble the database), (2) a Pan-Arctic study on the abiotic (and possibly biotic) biogeography of methanogens and methanotrophs, and (3) a Pan-Arctic study on changes to the taxonomy (and perhaps also functional potential) of the permafrost microbiome with thaw. Want to be involved? Please contact Jessica Ernakovich if you have a dataset and/or additional knowledge or interest in the project that you would like to contribute. Overview: The purpose of this synthesis is to elucidate empirical and mechanistic relationships that exist between ecosystem structure and permafrost thermal dynamics at the pan-Arctic scale. We will accomplish this by combining data from the Circumpolar Active Layer Monitoring (CALM) and Thermal State of Permafrost (TSP) networks with satellite and field observations describing vegetation structure and function. The ultimate objectives are twofold: 1) to improve process level understanding of how ecosystem influences on surface energy partitioning affect permafrost thermal dynamics, and 2) to quantify functional relationships between key variables that can be used to benchmark land surface models. Where and when will the arctic become wetter or drier? 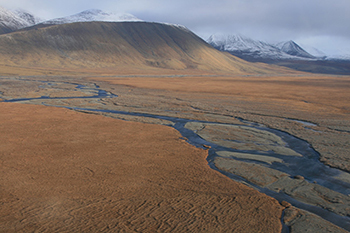 Overview: Lowland landscapes comprise ~30% of the Arctic and sub-Arctic and are characterized by large expanses of saturated soils, wetlands, ice-wedge polygon ponds and thermokarst ponds and lakes. The Alaska coastal plain and river valleys and deltas are examples of regions where low soil-water storage capacity due to the presence of shallow permafrost coupled with low evapotranspiration rates and poor drainage potential leads to flooded conditions across a large portion of the landscape throughout the thaw season. These low-gradient regions are often carbon and ice rich depositional environments that are likely to contribute relatively high CH4 emissions to the climate system as permafrost thaws. In continuous permafrost regions hilly landscapes have low soil-water storage capacity, low evapotranspiration and low precipitation, but are better drained than lowland areas due to topographically-driven shallow subsurface lateral flow. Even relatively small climate driven changes in thermal-hydrology may drive large shifts in ecosystem function. Earth System Models predict an overall drying of Arctic soils by the end of the 21st century due to increased evapotranspiration and active layer depth, but they are not able to represent the spatial and temporal heterogeneity in both increasing and decreasing lake, pond, wetland and wet tundra area observed in the Arctic over recent decades. This paper aims to review the existing data and predictions that provide insight into how eco-hydro-thermal-mechanical processes and subsurface properties control water storage capacity and vertical and horizontal hydrologic fluxes in the Arctic. The paper will synthesize this information into a framework that will inform what new data and modeling strategies are needed to enable better prediction of where and when Arctic landscapes will get wetter or drier. Overview: The greatest rate of warming in the arctic is expected during the non-growing season when cumulative carbon emissions can be substantial; however, there is large uncertainty in estimates of carbon emissions during the non-growing season and a lack of information on the relationship between relevant drivers (e.g., temperature, moisture, soil properties) and respiration at sub-zero temperatures. To address this knowledge gap, this breakout group will discuss a new synthesis that will examine current understanding of carbon emissions during the non-growing season. The synthesis aims to: 1) identify relevant drivers of respiration at <0°C, 2) examine non-growing season carbon emission patterns across the permafrost region, 3) quantify current estimates of non-growing season respiration, 4) identify methods for scaling from plot measurements to pan-arctic, and 5) identify knowledge and data gaps. In addition to discussing topics that will form the backbone of the synthesis, we will also discuss some detailed issues related to analyses (for example, how do we even define ‘non-growing season’ respiration? ; what regions should be included in the synthesis? ; how should we compare across methods?) and decide what topics will be included in the synthesis (e.g., CO2 and CH4 emissions, terrestrial/aquatic fluxes, thaw processes). Finally, for those interested in contributing to the synthesis, we will divvy up research, analysis, and writing tasks and agree on a timeline for completing the synthesis, with a goal of submission prior to AGU 2016. Overview: This activity largely builds on the synthesis activities conducted by David Olefeldt on wetland emissions (Olefeldt et al. 2013) and on lake emission (Wik et al. 2016). A key to producing these synthesized estimates will be to properly stratify the available data into wetland types and lake types that can be identified in spatial data bases across the permafrost region. The key challenge to scaling is to use reliable spatial data bases. Some efforts in developing spatial data bases for wetlands and lakes that do not overlap have been started for Alaska, and it is not clear whether the Alaska methodology will work across the entire permafrost region. Also, there is the issue of how much net methane consumption occurs across terrestrial ecosystems in the permafrost region. Finally, an important challenge is to quantify and partition methane emissions in the permafrost region among terrestrial gas hydrates, natural fossil fuel sources, and from oil and gas exploration and transport. This will require developing realistic estimates of terrestrial gas hydrate inventory obtained from observations and indirect evidence, and gas hydrate thermodynamic stability fields across the terrestrial permafrost region. 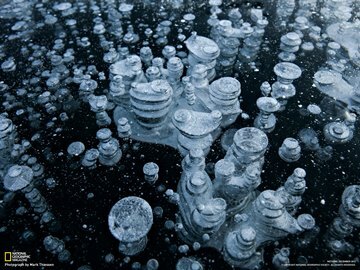 Because gas hydrate in the Arctic is closely linked with petroleum systems, the challenge will lie in teasing apart the relative amount of methane emissions from dissociating gas hydrate deposits, natural fossil sources of methane, and leaking petroleum systems. This group will need to identify how to overcome these challenges. The synthesis by this group will also try to ascertain what the data indicate about how much methane could be emitted from wetlands and lakes through 2300. Timeline: 2015-2017: Retrospective Analysis; 2018-2019 Prospective Analysis. Overview: This activity requires the assembly of the publicly available data on methane concentrations in coastal waters of the Arctic Ocean and its marginal seas and the use of those data in a range of methodologies for estimating methane emissions and uncertainties. This group needs to identify the data available, the appropriate strata for estimating methane emissions from coastal waters, the appropriate methods that can be used for estimating methane emissions for particular strata, and the scaling methodology across strata. An attempt will be made to separate emissions into their sources, based on available data, observations, and a reasonable knowledge of occuring processes. A key initial step to conducting this synthesis will require realistic estimates of gas hydrate inventory obtained from observations and indirect evidence, and gas hydrate thermodynamic stability fields across the entire cirum-Arctic shelf. Because gas hydrate in the Arctic is closely linked with submarine permafrost and fossil sources, the challenge will lie in teasing apart the relative amount of methane emissions from degrading submarine permafrost, fossil sources, and dissociating gas hydrate deposits. Biogenic methanogenesis in degrading submarine permafrost may be able to be estimated based on terrestrial permafrost carbon budgets (since submarine permafrost was once terrestrial). The contribution from gas hydrate deposits will be approached with a heat-budget analysis on the hydrate inventory estimates. Finally, an attempt will be made to understand methane emissions resulting from the delivery of carbon from the terrestrial ecosystem to coastal environments through rivers and coastal erosion. The synthesis by this group will also try to ascertain what the data indicate about how much methane could be emitted from coastal ecosystems through 2300. Timeline: 2015-2017: Retrospective Analysis; 2018-2019: Prospective Analysis. 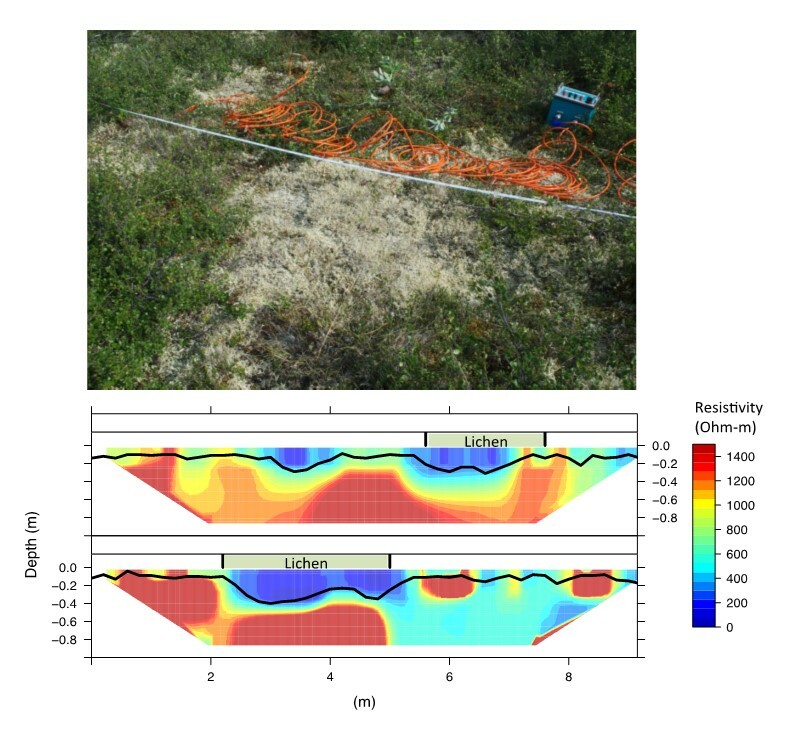 Overview: This activity will first conduct a synthesis of top-down estimates of methane emissions (derived from both flask networks, aircraft campaigns, and other observations) for the permafrost region (both on shore and off shore) to identify uncertainties in space and time (in recent decades). 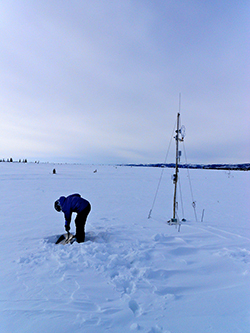 It will then conduct a synthesis that brings together the bottom-up estimates from products/activities 1 and 2 with the top-down synthesis to estimate contemporary methane emissions and their uncertainties across the permafrost region. These syntheses will be useful for the further development and evaluation of process-based models of methane emissions. Timeline: 2015-2017: Synthesis of top-down estimates; 2018-2019: Synthesis to reconcile uncertainties in top-down and bottom-up- retrospective estimates .